I have no doubt that drivers know little about specific rules for motorcycles. I don’t recall much about that in driver’s ed or the driver’s guide many decades ago (separate endorsements required in Washington). 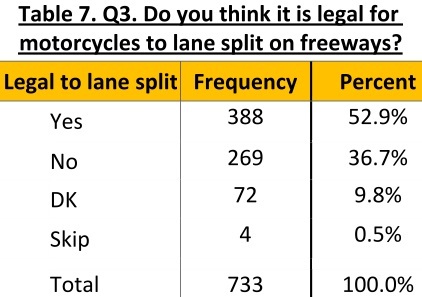 Most drivers would assume that lane splitting is illegal because they have been told in their state run and/or guided training that motorcycles obey the same rules as cars. Of course, that’s hardly Dunning and Kruger. 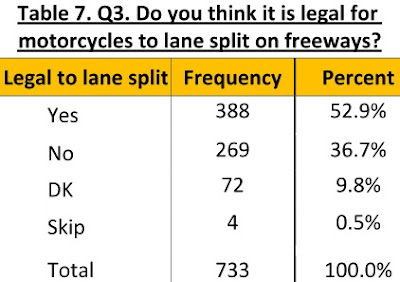 You should also note that article on Lane Splitting (6) you cite is a bit misleading. It is illegal to split lanes in Washington. The article implies otherwise. It may be tolerated, but so is speeding and all of the other traffic violations. The police can’t or don’t cite everyone or everything. 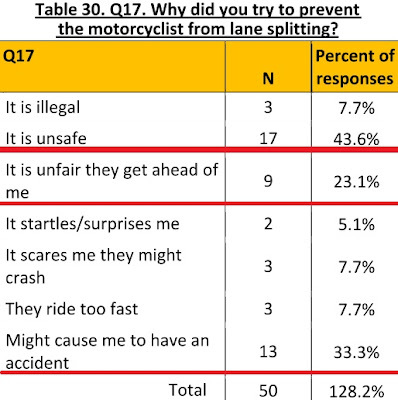 As for the idea that it may be safer to split lanes than to sit in traffic, does the study (or you) consider that those riders do both? So, instead of a lower risk they may actually increase their risk? 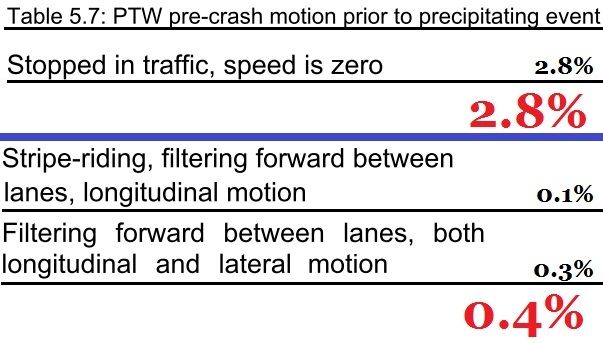 The most “exciting” part of congestion is the sudden stopping, often due to lane changing. Maybe not, but the rest is. The state should not be telling people that motorcycles, trucks, and automobiles obey the same rules as cars, because they don’t. Do you wear a seatbelt when you ride a motorcycle? Some states require helmets for motorcyclists, but not for automobile drivers. Any state that has carpool lanes must allow motorcycles to use them, regardless of how many people are on the motorcycle (unless the state demonstrates that it is unsafe for motorcycles to use carpool lanes). Are motorcyclists required to use windshield wipers? Are automobile drivers required to have their headlights on at all times (some states may not require this of motorcycles, but many do)? Why would anyone be foolish enough to believe someone claiming that motorcyclists and car/truck drivers obey the same laws? Because some authority figure said so. As if we don’t have that problem in EMS, too. I am not familiar with the Washington motor vehicle code. Do you have a link to the part that states that motorcyclists are prohibited from splitting lanes? When police tolerate speeding, it is usually up to a certain speed, or as long as the rest of traffic is travelling at a similar speed. All of the other traffic violations are tolerated? You state that lane splitting is specifically illegal for motorcyclists in Washington. Please provide a link to the regulation. The article seems to be very clear and at all not misleading. Read the last part in bold type. Suppose you contact someone authorized to comment on the enforcement of traffic laws, as the author stated; that person states that lane splitting is tolerated; you think that would be misleading. Why? 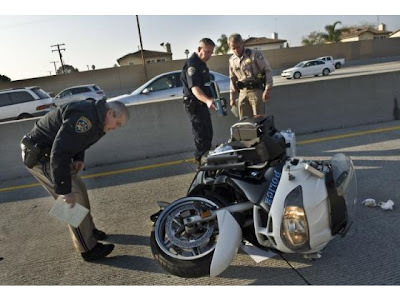 Suppose you contact someone authorized to comment on the enforcement of traffic laws, as the author stated; that person states that lane splitting is not tolerated; you think that would be misleading. Why? 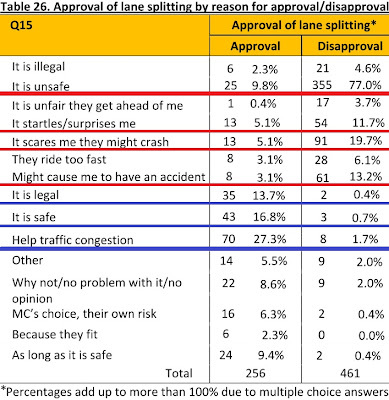 As for the idea that it may be safer to split lanes than to sit in traffic, does the study (or you) consider that those riders do both? The study only looks at crashes and analyses the causes of crashes. 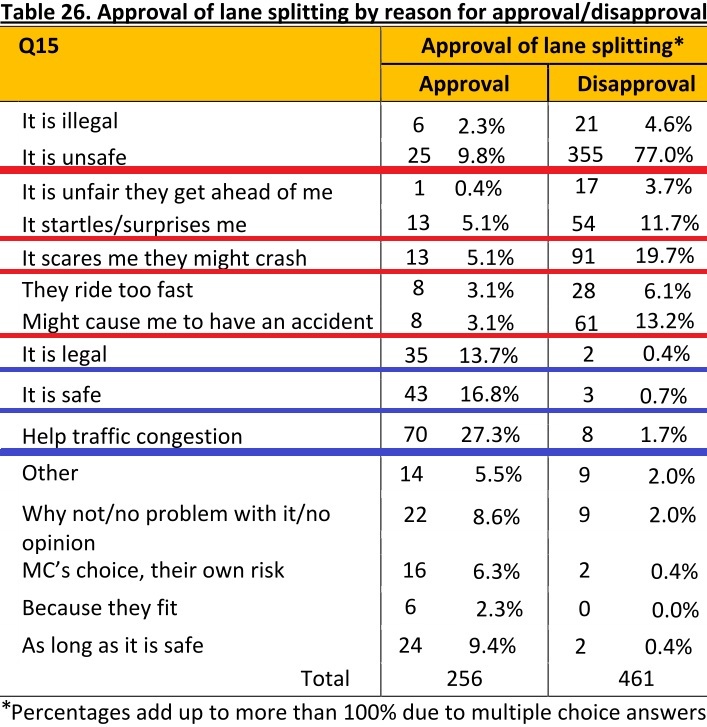 The survey shows that many people only split lanes some of the time. The more time a person spends splitting lanes, the more frequently we should expect to see lane splitting crashes and the less frequently we should expect to see crashes when the motorcyclist is not moving. So, instead of a lower risk they may actually increase their risk? Increase what risk by doing what? Please be more clear on what you are assuming. I don’t know of any evidence that lane splitting is as dangerous as sitting in traffic for motorcyclists. Please provide some evidence to support your opinion. People tend to think of giving morphine as dangerous, but that is clearly an example of the Dunning-Kruger effect. People tend to think of giving midazolam as dangerous, but that is clearly an example of the Dunning-Kruger effect. People tend to think of giving hig-dose nitrates as dangerous, but that is clearly an example of the Dunning-Kruger effect. What is dangerous is giving medication based on mythology. Likewise, riding a motorcycle is not made any safer by basing actions on mythology. The most “exciting” part of congestion is the sudden stopping, often due to lane changing. 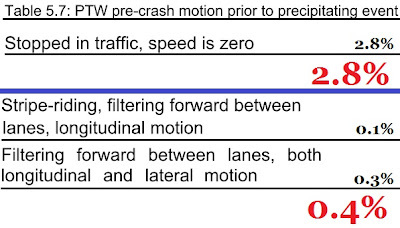 And yet the crash statistics do not demonstrate that your sudden lane changing is knocking down motorcyclists. There are ways to minimize the occurrence of surprises while driving. I don’t know how you drive, bit if you find that you are often surprised, you might consider that as feedback on the way you are driving.